Our grooving head is positioned on the undercarriage of very efficient, high production machines that are capable of grooving runways and bridges. This process eliminates hydroplaning and results in improved braking traction for the aircraft. Grooving a runway provides increased skid resistance for a shorter braking distance of the aircraft on wet pavement. The grooves help to drain the runway, provide a better coefficient of friction, remove oil, molten rubber and other materials from the tire footprint. They also provide interruptions in the pavement surface to facilitate the dispersion of thin ice from the tire path. Safety grooving prevents serious loss and damage to aircraft. Performance can be enhanced with proper grooving, which allows water runoff and increased traction. 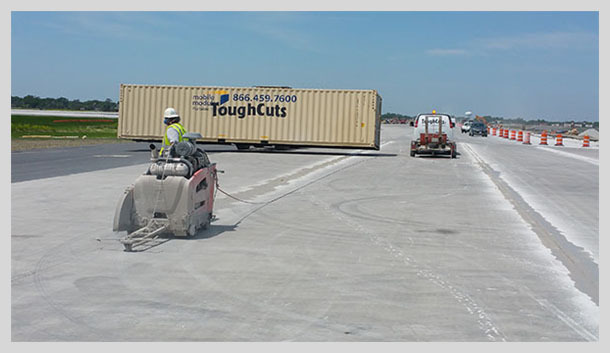 On concrete pavement, grooving lasts the entire life of the system, which further reduces maintenance requirements. Grooving is a technique to prevent hydroplaning during aircraft landings and take-offs during inclement weather. Grooved runways reduce the stopping distance to nearly dry performance.